Beltran and Casilda Arellanes at a Trump campaign rally in Bayfront Park in November. "I’d rather Trump to get elected than Hillary, just to see something change" said 15-year-old Casilda Arellanes as she looked out on a sea of 'Make American Great Again' hats at a Miami rally days before the presidential election. "I think a Trump presidency would be very interesting," her 17-year-old brother Beltran chimed in. "I think there will be so many protests, so many riots. It will just be like the 60s again, and people will awaken to the problems in their country." 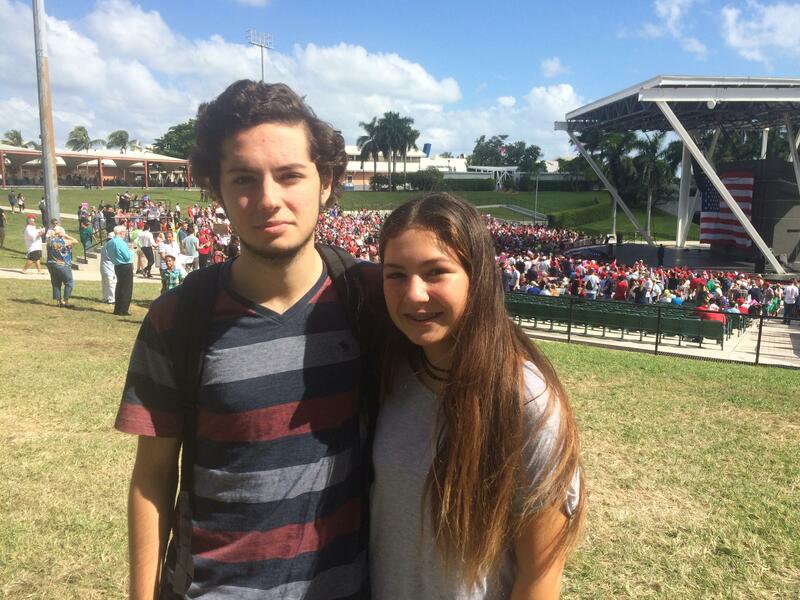 Beltran and Casilda had their parents' blessing to skip class and go to the Bayfront Park Ampitheater to catch a bit of American history in real time, merely six days before the election. 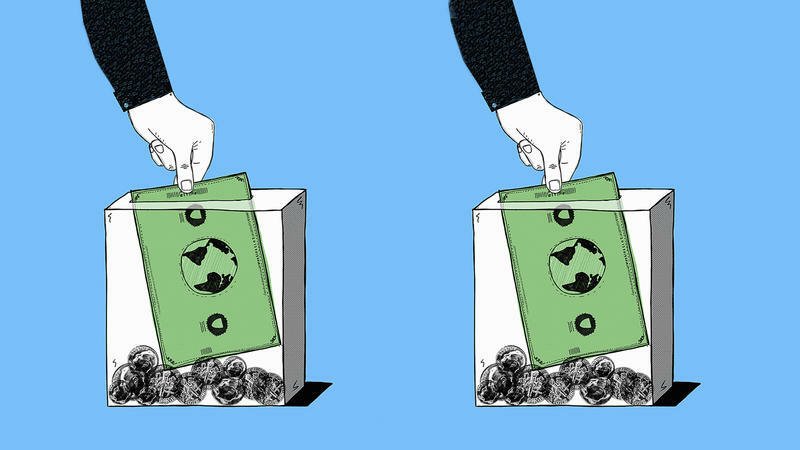 Time will tell if their hopes are vindicated by a surge in progressive activism that outlives the Trump administration, or dashed by a rightward lurch in the courts and federal agencies. Recently, WLRN caught up with Beltran to get a 17-year-old’s perspective on the first two months of the Trump presidency. WLRN: During the campaign, it seemed to you that Clinton and Trump were, maybe not equivalent, but they were close enough together that you thought we might as well see what a Trump presidency might bring. Has your perspective or your outlook changed on that at all? BELTRAN: No, not really. I mean, I clearly accept that for me to say that is a bit of a privileged position, because I’m not in an economic situation which would be, you know, directly harmed by a repeal of Obamacare, for example, or many other policies that Trump could push. Protests are definitely there, you know, and people are definitely inspired to take action. But I think real action is going to come once he starts, you know, deregulating Wall Street. 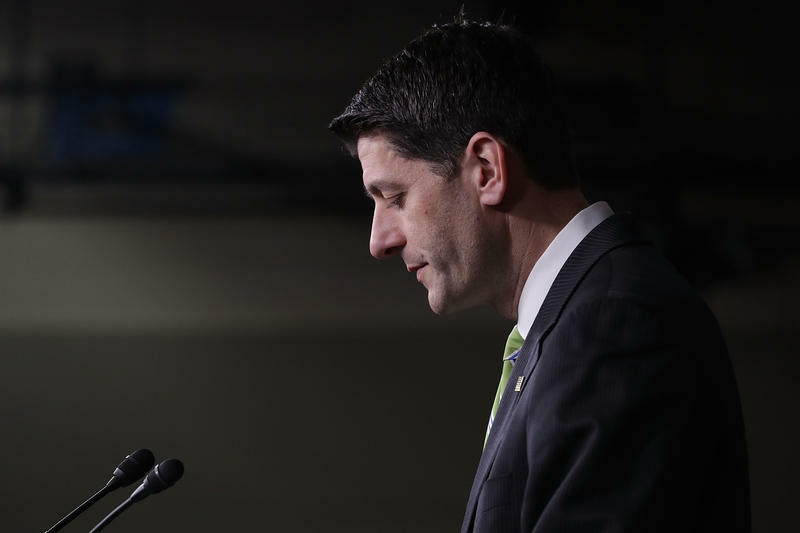 Once he repeals Obamacare. In the moment in which the prices of produce, for example, start raising [sic], you know, because of all the deportations, if there is a legitimate deportation force, that’s when people will come out and truly seek alternatives and seek action. How do you think that coming of age during the Trump presidency will affect the political outlook of people in your generation? Well, hopefully it will radicalize many people. That’s what I’m definitely looking forward to—people who look at the Trump presidency and think, ‘Wow, how could we have avoided this?’ And they look at the past eight years under Obama and they see that all these neo-liberal policies have not really worked for ordinary working people…So, evidently when a strongman, when a populist comes and promises them everything, you know, it’s very easy to—when our system can’t provide for the majority you always have these backlashes. What are you feeling optimistic about and what are you feeling pessimistic about at this current moment? Definitely environmental regulations. I think that’s something that’s very scary, you know, because, sure, his presidency might only be four years, but we’re already way behind when it comes to putting an end to climate change….I mean, pessimistic ideas I can go on for hours, you know, about Trump, but…. I’m hoping you can give me a little bit of insight about what you and your friends and your peers are talking about when you look at the way people are discussing politics in Miami, or on TV, around the country. What are your conversations like? Well, I mean, that’s a funny question, because I don’t really have friends that are interested in politics. If anything, the only sort of conversations are, you know, this Milo guy [Milo Yiannopoulos] , they love him, you know. They think he’s hilarious. Not necessarily because they agree with what he says, but they just think he’s a crazy guy who attracts a lot of attention. They see it from a superficial perspective. I think he’s a very dangerous person. My friends, they’re not really too interested. At this age is when you start to realize that, you know, policy has an influence in your life. And this is a moment when people should be caring and should be taking the initiative to study, to read a bit. But it’s mostly just the superficial aspect of politics that people care about, you know—the scandals, the corruption. Things like Trump saying a curse word, or Richard B. Spencer, the Alt right guy, getting punched in the face, you know. A lot of people are sharing that, even though they may never have heard him speak, they just hear Nazi gets punched and they share it. Beltran Arellanes is a 12th grader at MAST Academy. He plans to start college in New York in the fall, where he wants to study political science.